Duties: Hands on design and creative direction, brand design and strategy development. Responsible for all aspects of running a design business from proposal to printing: digital technology, responsive web design, traditional print, graphic design, video and photographic media services. Duties: Support/guide partners and pursuit teams through the development of strategic communications for Deloitte’s largest and most complex pursuits. Work closely with senior partners and client service teams in conceptualizing, designing, and developing print/digital client proposals, presentations, and related business development materials that illustrate complex concepts and distinguish Deloitte in the marketplace. Ensure a creative, yet consistent look and feel that adheres to and supports the Deloitte brand, visual identity, and messaging. Duties: Head of design and computer technology team. Accountable for: establishing/maintaining the creative philosophy, brand development, and all aspects of design/promotion reaching from traditional print and responsive web-based to social media and environmental solutions. Duties: Head of the creative department. Responsible for all creative aspects of design from concept through production. Set the tone for the creative philosophy of the company and the standards for the quality of the workmanship. Oversaw the design of branding and advertising to ensure communications support get READY girls’ dialogue with the consumer. Duties: Design team leader. Emphasis on the development and concept of unconventional, new technologies developed by the product team. Focus: an imaginative, experimental design approach. Duties: Design material for numerous types of visual communication media utilized in advertising and promotion. Work directly with clients and service bureaus for consultation of projects. Duties: Team lead of a flexible, guerrilla marketing team focusing on innovative, strategic thinking, pragmatism, and creativity. Duties: Creative team lead. Craft and continually refine web-based brand and visual identity. Instrumental in positioning CDNOW for successful joint ventures with MTV, VH1, Rollingstone, AOL, Gap, and others. Facilitate product differentiation as well as core product merchandising. Provide overall design services to the entire corporation, integrating visual image consciousness and consistency into the culture. Duties: Manage art department. 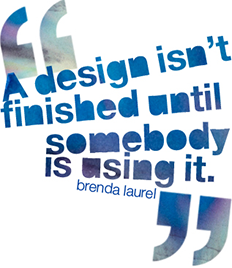 Develop and execute progressive design concepts for clients. Play a vital role in the creative process. Duties: Provide vision and leadership that align with SCAD’s initiatives with a particular focus on communication arts (advertising, graphic design, illustration, photography, sequential art and writing) and fine arts (painting and sculpture). Prepare and revise academic program plans, initiate academic integrity and quality, establish academic goals, promote and serve as a model for teaching achievement, advocate on behalf of student and faculty interests and act as a liaison between students, faculty and administration. innovators. The core of graphic design at SCAD is design thinking. This fundamentally creative process — thinking by doing — encourages students to see differently, shift focus, look from multiple perspectives, and realize how perception influences meaning. SCAD’s award-winning future graphic designers become fluent in the visual language that defines today’s powerhouse brands and top-flight organizations. Duties: Develop/evolve the graphic design program with the goal of narrowing the distance between design education and practice. My roles as Creative Director/Creative Strategist armed me with industry experience I’ve adapted for use in the classroom. If advancements in graphic design occur, this innovation is integrated into the course curriculum to better align design education with our industry’s ever evolving demands. Responsible for teaching Freshman, Sophomore, Junior and Senior level undergraduate students. Duties: Responsible for teaching Sophomore, Junior and Senior level undergraduate students. Duties: Advertising Design I, Advertising Design II, Senior Seminar: Consumer Product Advertising, Senior Seminar: Non-Profit/Corporate Institutional Advertising, Visual Translation, Introduction to Digital Design II, Print Production and Historical Survey of Graphic Design B. Recognized and honored for innovative approaches to teaching. Notably, taking the elements of the Historical Survey of Graphic Design large classroom lecture format and reinventing the course as an online offering and researching the methodology of “fine art distance learning” in order to discover new ways to offer virtual classes that are specifically crafted for the visual learning style of art students. The knowledge and research in the use of technology in the curriculum resulted in presentations to the College of Visual and Performing Arts faculty, at the invitation of the Dean of the College of Visual and Performing Arts, to the Kutztown University campus through the Center for Enhancement of Teaching and at the Pennsylvania State System of Higher Education system-wide conference in Harrisburg, Pennsylvania.